How to Series: Creating a Community Vision. Urban designers and planners are passionate about bringing new life to those special parts of the city that have lost their heart and identity. Whether it was through urban flight, a change of industry, or the loss of public transportation, neighborhoods that were once the gems of our cities seem easily forgotten. Urban designers and planners are continuously working to return that glory to our city centers. As a designer myself, I understand how easy it can be to get swept up in the physical design of a place. Being able to vision what a place will look like and how it will function comes as second nature. However, the most important part of redevelopment is to remember that ultimately design is about people. No matter where you are in the city, that neighborhood, street, or public space belongs to people. It affects how they live their life and it informs their identity. The best urban design should reflect the vision of the community, not a designer’s. Identifying the vision of a community is easier said than done. People have different dreams, desires, and priorities for their neighborhoods. One of the biggest responsibilities urban designers and planners have is to define a cohesive vision that can guide development. How is this done? One way to identify a community vision is through a series of workshops with the community. 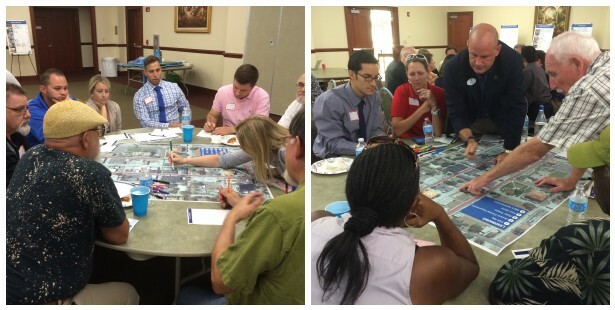 CNU Tampa Bay, the regional group of the Congress for the New Urbanism, had the opportunity to run a Visioning Workshop for Franklin Street in the Tampa Heights neighborhood. Right outside of Tampa’s urban center, this section of Franklin Street was once one of the most popular commercial and retail streets in the City. Served by the streetcar, it was a hub of entertainment. Now, there are a small collection of historic buildings that still define the street among a much larger group of abandoned structures and surface parking lots. A couple of cafes and small local businesses are the highlight of Franklin Street today, and with their commitment to the neighborhood, are starting to bring some life and most importantly passion into revisioning the once bustling street that is so important to Tampa’s identity. Franklin Street and the Rialto Theatre: Now and Then. 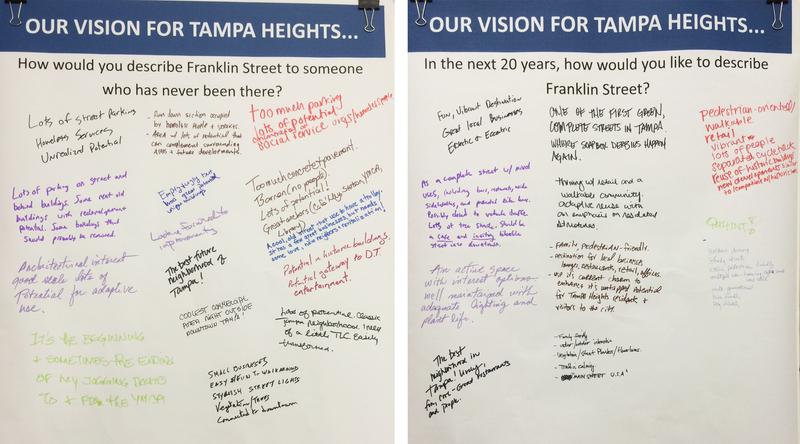 Given the important responsibility of helping the citizens of Tampa Heights to define their vision for Franklin Street was quite a responsibility. We accomplished it through a series of interactive and creative exercises that allowed the community to explore their vision in different ways: discussion, polling, answering questions, drawing and map exercises allowed all participants regardless of their comfort level to be integrated into the visioning process. Here are the steps below for creating a successful visioning workshop. 1) Ask participants how they would describe a place now, and how they would like to describe it in the future. These are simple questions that are easy for people to answer that will identify a large group of priorities, concerns, and opportunities for a place. 2) Ask people what they like. The majority of people always have an opinion and they love to be able to share it. Sometimes its hard for them to know how to articulate how they see the appearance and operation of a place. A great way to make this process easier is to create a visual preference polling activity. In this case, we identified urban design elements that are important to placemaking along a street: architectural character, building frontage, building scale, public realm activity, parking options, bike facilities, and street furniture; and provided pictures of many different options for each. 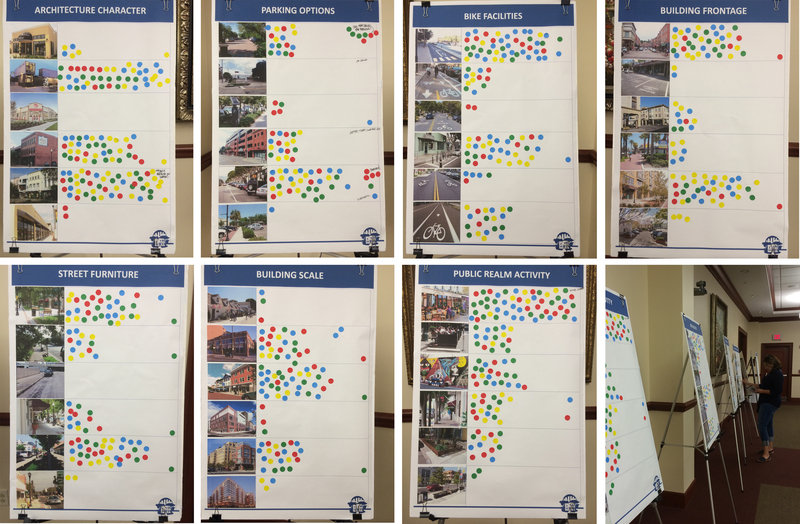 Using stickers, participants voted for pictures they liked best for Franklin Street. As you can see below, a very visual and easily understandable result occurs. This allows people to comprehend how others in their community see a place quickly and clearly. 3) Identify what works and what doesn’t. Small group discussion is an effective way to make sure every participant has a voice. In large groups or in public activities, not everyone feels comfortable sharing their opinion. A compelling activity to do in small groups is a table map exercise where participants can identify the positive assets of a place, as well as its biggest opportunities. Participants can mark these on a map and identify the physical location where appropriate. This helps define the priorities of a community and can show insight into those important elements of a place that can serve as a foundation for building a new identity. 4) Ask people to visualize. For half of the people in the room who have a left brain, creating an opportunity for them to visualize their ideas can be the most effective way to identify the future vision of a place. Whether it’s the design of a street, site, or neighborhood asking people to draw can inspire creativity. Even the most unconventional ideas can identify the most unique design solutions. 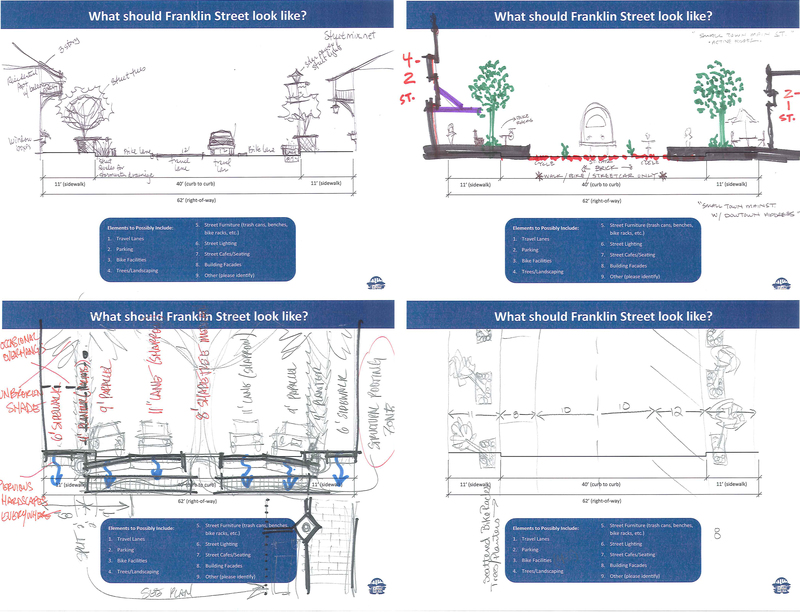 For Franklin Street, we asked participants what it should look like and gave them a list of potential elements they could include in the right-of-way. While everyone’s designs will be different, common and recurring elements and themes can be identified. It’s very important that participants in a visioning workshop walk away from the process knowing they have contributed to a meaningful process. Having small groups report back to the larger group about their top priorities for a place is the first step to showing participants that an agreed vision is starting to form. This is also a helpful summary process for urban designers and planners. Urban designers and planners will walk away from the visioning process with a plethora of information and data. It is their responsibility to make conclusions and identify clear themes on which to help a community build their vision. Depending on the scope of the project and the next steps, these conclusions may the basis for further public involvement or neighborhood events. Or it might be appropriate to publish results publicly in a report, online, or through social media. Either way, there must be follow up steps with members of the community. A community workshop is just one way to identify a vision for a place. Depending on the scale or goals of a project there might be more appropriate and more extensive processes to reach a conclusion. However, even the smallest scale of design projects should be based off a conclusive direction from the public. A simple workshop with 6 interactive steps is an efficient and very effective way to identify the goals, passion, and vision of people and place. ← Andres Duany’s Lean Urbanism. This is really an awesomely creative process. I plan to use aspects of it at an educational conference for visualizing the future of our state.